New Year's Eve in Times Square: simultaneously iconic and the last place any New Yorker would be caught dead, unless they are literally dead and the body was dumped in Times Square. But leave it up to the chains that populate the whirling maelstrom that is Times Square to find a way to capitalize on the influx of out-of-towners: namely, by charging an arm, and possibly a shank, for the pleasure of dining near the ball drop on Dec. 31. As the New York Post reports, gone are the salad day when unlimited soup, salad, and breadsticks cost you a measly $6.99 for lunch at the Olive Garden. They're not gone forever, mind you, but merely much more expensive for one night. 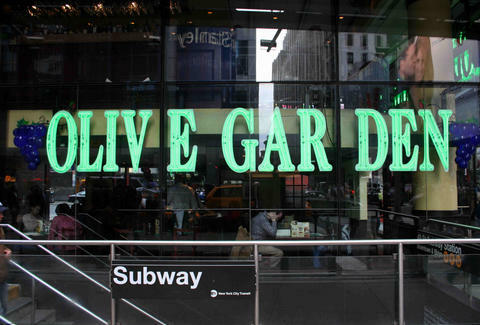 Dinner at the Times Square Olive Garden will set you back a cool $400 on New Year's Eve. For those four Benjamins, you'll get an open bar, dinner buffet, a DJ, and a champagne toast at midnight. That's up from $350 last year, according to the Huffington Post. And still considerably more than the most expensive item on the menu, the Steak Toscano, which costs $29.79. While the restaurant doesn't guarantee a view of the ball drop, last year, according to one reveler, it did take patrons out back to a cordoned off section of the street where ticket holders were able to witness the iconic ringing in of the New Year. Ball Drop, which offers details about parties around the annual gathering, lists the Olive Garden event as being sold out. But an Olive Garden employee told Thrillist Monday tickets for the event were still available for $400, and that the restaurant had sold around 200 tickets thus far. So if you go, you'll be far from alone. Now, while $400 is a hefty price for casual Italian fare, as the Post report details, it's far from the most expensive chain meal on the last day of 2015. No, Bubba Gump Shrimp comes it at a staggering $799 per person, while a VIP couples table at Ruby Tuesday will run you $1,699. In other news, I'm pretty sure I'm staying home this year. Ryan Craggs is Thrillist's Senior News Editor. The last time he was at Olive Garden, he ordered Steak Gorgonzola-Alfredo. Follow him @ryanrcraggs.